MOSCOW – The grand jury decision not to press charges against white police officer Darren Wilson, who, in August fatally shot an African-American teen in the US city of Ferguson, has triggered a new wave of protests. The killing of 18-year-old Michael Brown, who has unarmed at the time, sparked massive protests against police brutality in Ferguson and around the country. Much like in August, this new wave of protests have turned violent, with police resorting to the use of tear gas to disperse angry crowds, sparking further outrage and fueling the debate on excessive use of force by US police officers. “What we saw tonight was much worse than what we saw any night in August. Bricks were thrown at police officers, two St. Louis County police cars were set on fire and police seized an automatic weapon,” the St. Louis County Police said Tuesday on its official Facebook page. On November 17, Missouri Governor Jay Nixon declared a 30-day state of emergency ahead of possible unrest should the grand jury decide against indicting Wilson. County police reportedly spent some $100,000 to stock up on riot gear, pepper spray, smoke grenades and rubber bullets ahead of possible new protests. According to local gun shop owners interviewed by CNN, gun sales surged ahead of the grand jury verdict. Confirming authorities’ predictions, protesters have been attacking police with rocks, bottles and Molotov cocktails. 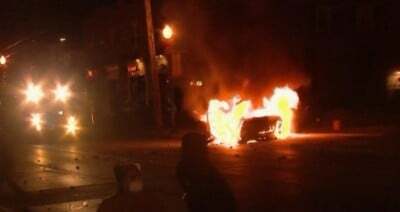 Several businesses and police cars were set alight, while firefighters reportedly struggled to reach multiple fires taking place simultaneously in the city.According to St. Louis County Police Chief Jon Belmar, about 29 demonstrators were detained during the first night of protests. At least 13 people sustained injuries in the riots, including two with gunshot wounds. These received treatment at local hospitals, the St. Louis Post-Dispatch newspaper reported. A producer working for the RT-owned video news agency Ruptly, Lorena de la Cuesta, was injured during protests in the US city of Ferguson. The US Federal Aviation Administration has issued a flight ban over Ferguson amid reports of guns fired into the sky, while the St. Louis suburb of Nixon requested more national guardsmen. According to the executive director of Amnesty International USA, the organization’s observers in three separate locations in Ferguson had been affected by tear gas as police officers raided seemingly safe spaces, such as cafes. Meanwhile, three journalists were reportedly attacked by a group of protesters in the St. Louis suburb. “Three of us journalists attacked by gang. Poor reporter we were with punched and had wallet stolen,” the Guardian’s Washington correspondent Paul Lewis said on his Twitter. As a result of the grand jury verdict, demonstrations stretched beyond Ferguson, as thousands of people in 90 cities including New York, Los Angeles, Boston and Washington D.C. took to the streets to protest police brutality, chanting “hands up, don’t shoot” to show solidarity with Brown, who, according to some witnesses, was killed in a surrender posture.